New Zealand is world renowned for its scenery and natural wonders, and the south arguably has some of the best that New Zealand has to offer. Many of the majestic vistas seen in the award winning Lord of the Rings movies are found in the south, and movie producers and international tourists alike flock here to take in the stunning sights of nature. You may not want to spend all your time in the south naked in a deckchair with a good book, but fear not, our club grounds provide a perfect base to explore the best part of the mainland. There are many reasons to visit the south and much on offer. You really are spoilt for choice, with numerous places screaming out for a visit. The rainforests and fiords of Fiordland have World Heritage status and are simply stunning, and have featured in many wildlife documentaries, including the Walking with Dinosaurs 3D movie. Milford Sound (right), where seals, dolphins and spectacular waterfalls can often be seen, is rightly world famous, and there is also Doubtful Sound and Deep Cove. Nearby is Lake Te Anau and its glowworm caves, as well as Lake Manapouri. For those that enjoy tramping through nature, there are many options, including the Milford, Routeburn and Kepler Tracks and the recently created Hump Ridge Track, which features the Percy Burn Viaduct, the largest remaining wooden viaduct in the world. On the south coast is the seaside township of Riverton, site of the first European settlement in NZ, and it has an excellent historical museum following Maori and European history in the area. Nearby Tuatapere is the point to set out on the Hump Ridge Track. 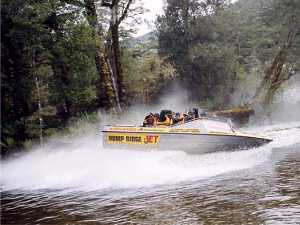 Also available are river trips on the Hump Ridge Jet, which combines nature and adventure. The port of Bluff, famous for its oysters, is at the end (or start) of State Highway 1, and is another of NZ's oldest European settlements. From Bluff Hill one can view the nearby Tiwai Point Aluminium Smelter (tours available), the Awarua Wetlands and Stewart Island. Reached by ferry from Bluff or by air from Invercargill, Stewart Island is an unspoilt oasis of nature. The small township of Oban at Halfmoon Bay is the only sign of civilisation, the rest of the island — Rakiura National Park — is native forest and belongs to the varied wildlife, which includes kiwis, kaka, tui and bellbird. Strolling along deserted sandy beaches and through the bush with only the sound of birds for company is truly relaxing, and highly recommended. Between Bluff and Stewart Island is Foveaux Strait, popular for fishing, and if you're looking for a real adrealin rush, there are even companies that allow you to swim with great white sharks. They do provide a cage. 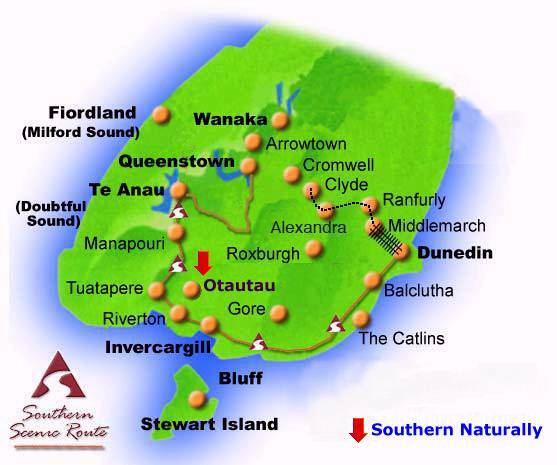 The Southern Scenic Route is a route recommended to tourists, going from Balclutha south of Dunedin and follows the coast through the Catlins, Invercargill and up to Te Anau. The Catlins includes rainforests, wild coasts and at Curio Bay can be seen a petrified forest, dating back millions of years to the Jurassic period. Invercargill, home of Burt Munro, and made famous by the movie 'The World's Fastest Indian', is the largest city in Southland, offering good restaurants, shopping and attractions, such as the Southland Museum, art gallery and astronomical observatory. At the museum one can view the tuatara, an ancient lizardlike reptile unique to NZ that has existed essentially unchanged since before the time of the dinosaurs. While once common, it now only survives on a few offshore islands. Invercargill also has the Anderson Park art gallery which is housed in an historic stately home in parklike grounds, as well as beautiful Queens Park situated in the city centre. It features gardens, wildlife enclosures, a walk-through bird aviary, play areas, an 18-hole golf course and the Southland Museum. Queenstown and Lake Wakatipu with its famous scenery and adventure tourism is another jewel of the south. Bungy jumping, jet boating and paragliding compete with skiing, wine tasting and cruises on the historic steamship, the Earnslaw. Nearby is the old goldmining town of Arrowtown, as well as other interesting Central Otago destinations such as Wanaka, Cromwell, Alexandra and the historical township of Clyde. Add to this that some rivers in Southland have the best brown and rainbow trout fishing in New Zealand, possibly the world. 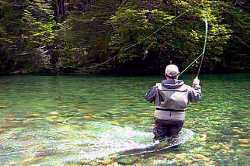 Consequently our rivers attract fly-fishing enthusiasts from around the globe. And of course there is the famous Southern hospitality. Really you could not want for more. So if you're a travelling naturist, then come and visit us in our peaceful and relaxed setting, and explore all the many and varied facets that the south has to offer. You won't be disappointed.